My favorite parts about this time of year are all of the parties and gatherings. Last weekend, we spontaneously had a few friends over, despite the fact that our home was a mess. Everyone wore their comfiest clothes and we all piled on the couch (Luna included) to eat ginger spice cookies and watch Home Alone. It's been one of my favorite evenings of the season. Whether they're spontaneous and slightly messy, or pre-planned and beautifully styled, enjoying a meal with friends and family fills me to the brim. Which is why I was so excited to collaborate with Mackenzie of Feast and Fable on this holiday gathering shoot! Being surrounded by optimistic, like-minded people is something I try to be intentional about, and Mackenzie is absolutely one of those people! Her passion for purposeful living and spending quality time with those she loves over a beautiful, well-prepared meal is palpable and contagious. It's also something I agree with wholeheartedly, so I couldn't wait to share this experience with her! During this time of year, many of us are subject to quite a bit of stress (especially if you're the host of holdiay gatherings), and it can cause us to forget the larger meaning of this season. So as we were considering the menu, we wanted to be intentional about creating something that would embody simplicity, while also featuring a few of our tried and true classics. We came up with quite a variety of delicious holiday dishes, and had a blast choosing which ones we would each contribute. 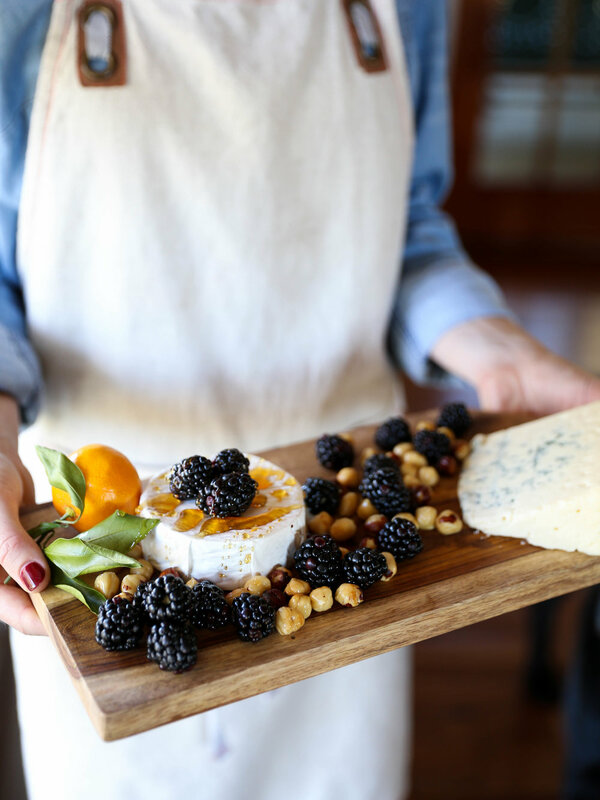 Mackenzie started with a delicious, incredibly simple cheese board that included a goat brie, topped with blackberries, hazelnuts, and drizzled with local honey. Brie is one of my all-time favorites, and it was all I could do to not to eat this entire thing! Cheese boards are so easy to put together, and they immediately make you look like you're a hosting pro. Plus, it's great to give people something to snack on while the table is being set, or just in case a dish is taking a tad bit longer than expected! Mackenzie's friends, Taylor and Ben, live on a beautiful farm just on the outskirts of Nashville and were kind enough to let us use their place for this dinner. I couldn't have dreamt up a more perfect setting for this type of gathering. As we set the table, we made sure our guests would feel welcome, cozy, and undistracted. So we placed a gorgeous, handmade farm table off to the side of the house, just close enough to the fire pit, and draped blankets across the benches in case the temperatures dropped. Mackenzie made a gorgeous rustic garland out of eucalyptus that we placed across the table, along with a few candles for extra lighting. To finish the look off with a subtle holiday feel, I added a sprig of rosemary and a deep wine-colored ribbon to each of the beautifully minimalist menus, created by one of my very best friends, Amy May Paper. As if the setting itself wasn't wonderful enough, the food was delectable! 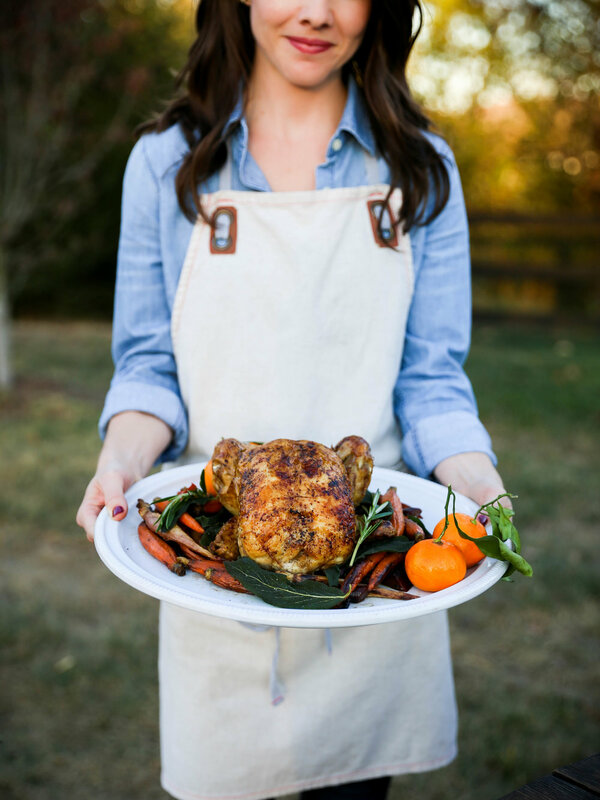 Mackenzie made this incredibly flavorful Roast Chicken with Crispy Sage, that we all couldn't get enough of! Seriously, the flavors were amazing! Click here and try her recipe asap! I wanted to create a healthy spin on a few of my favorite classics, so I contributed three dishes: A Shaved Fennel Winter Salad with Cinnamon Balsamic Dressing, Roasted Brussels Sprouts with Pomegranate Seeds, and my very favorite, Roasted Garlic Cauliflower Mash. I actually took the shaved fennel salad to my family's Thanksgiving this year, and it was a hit! I would have never guessed that, of all the food there, people would be commenting on how delicious a salad was! The roasted garlic mash has been one of my go-to recipes as of late. It takes hardly any time and is shockingly savory! Thankfully, right before the point of unbelievable fullness, Mackenzie reminded us to save room for some of her gorgeous Cherry Pie for dessert. I have a feeling I could've easily made room regardless. She topped it with the one and only Jeni's Spiced Sweet Cream Ice Cream with Holiday Notes, and I'm pretty sure those two items were made for each other. To be candid, I'm not a huge cherry pie person. And while I thought this was one of the most beautiful pies I'd seen, I didn't expect to love eating it all that much. But immediately following the first bite, I was trying to figure out if there would be enough for seconds. I couldn't believe how good it was! 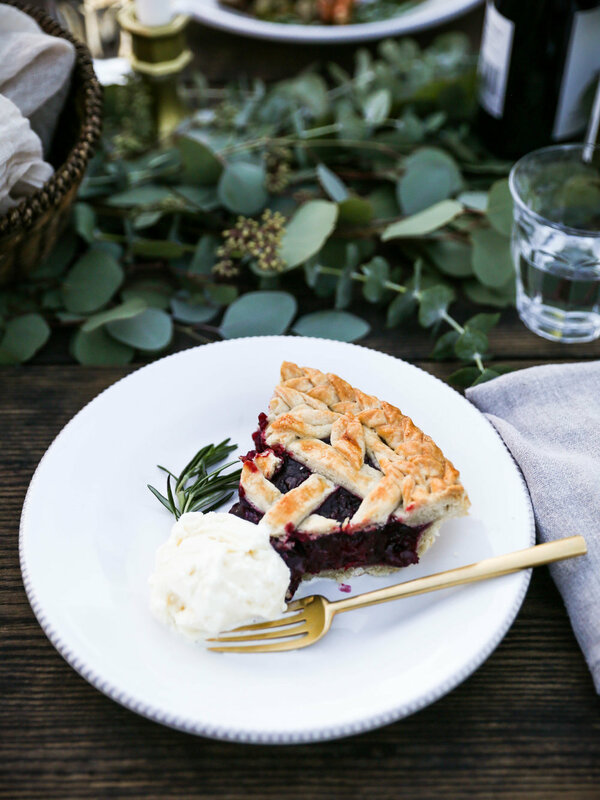 From the flavors to the consistency, this pie was so delicious that I've been sitting on pins and needles waiting for the recipe to hit her blog, so I can try it for myself! My stomach is growling just thinking about it. 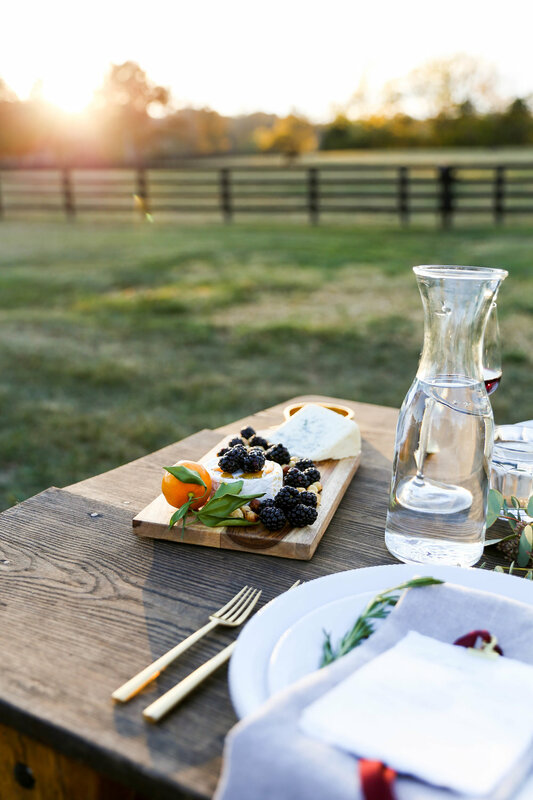 Sharing a meal with friends and watching the sun set over the trees while horses roamed in a nearby field, provided an incredibly soothing experience. It almost had me reconsider my fondness of living in the city... almost. There is so much to be grateful for during this holiday season! I know I'm looking forward to spending quality time with my family and friends! I hope these recipes give you some easy, healthy options for any gatherings in your very near future! For more delicious recipes and hosting inspiration, check out Mackenzie's blog, Feast + Fable, or follow her on Instagram @feast_and_fable. To see some of the prettiest paper goods that have ever existed, follow Amy May Paper on Instagram @amymaypaper. Gold Flatware and Linen Napkins are from 12th Table. All dishes are from Pottery Barn.